Consumers have no way of knowing that celebrity-branded pot is any different from what they could get in a plastic baggie from a corner drug dealer. “They haven’t issued a single patent yet. But generally speaking, there is broad agreement within the patent law community that they will,” said Eric Greenbaum, chief intellectual property officer for Vireo Health, which is seeking a patent for a strain of marijuana to treat seizures. Companies like Vireo are betting that if marijuana becomes legal nationally, they will be first in line to claim legal ownership of whichever type of marijuana they have already developed. Pot companies also are filing state-level trademarks, thereby avoiding the snag in a federal trademark application: the requirement that the mark is used in interstate commerce, which remains off-limits for pot companies. In Colorado, for example, there are nearly 700 trade names and 200 trademarks registered that include the word “marijuana” or a synonym, Kamin said. Pot producers also are claiming everything they can that doesn’t involve actual weed. So a marijuana company could trademark its logo or patent a process for packaging something, without mentioning that the “something” is marijuana. The marijuana industry certainly has been on the receiving end of legal threats from other companies that do have trademark and patent protection. Cease-and-desist letters aren’t uncommon in the mailboxes of marijuana companies, whether it’s for making a candy that looks like a non-intoxicating brand or for selling a type of pot that includes a trademarked word or phrase in its name. The Girl Scouts of the U.S.A., for example, says it has sent dozens of cease-and-desist letters to businesses selling a popular strain of pot known as Girl Scout Cookies or another called Thin Mints. “The use of our trademarks in connection with drugs tarnishes the Girl Scouts name,” the organization says in the letter it has sent to pot sellers primarily in California, Colorado and Washington. 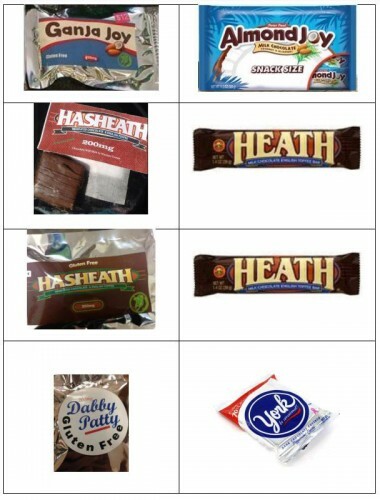 Last year, The Hershey Co. sued two marijuana companies in Colorado and Washington for selling “Reefer’s” peanut butter cups and “Dabby Patty” candies, which resembled Hershey’s Reese’s Peanut Butter Cups and York Peppermint Patties. Both pot companies agreed to stop selling the products and destroy any remaining inventory. But the industry can’t use those same laws to protect its own brands. “We’re in a new industry, where the benefits of federal protection aren’t open to us,” said John Lord, CEO of LivWell, a 10-store chain of Colorado marijuana shops that recently entered an agreement to sell Leafs By Snoop, the entertainer’s new line of marijuana. LivWell grows the Snoop pot alongside many other strains but charges up to $175 more an ounce for the rapper’s brand, which is sold from behind a glittery in-store display.